Memory: Goal is to find house pairs with either the same colour or the same house form. A memory version that is not overly complicated and can be played by little kids from three years of age, helping them to learn about colours and shapes. 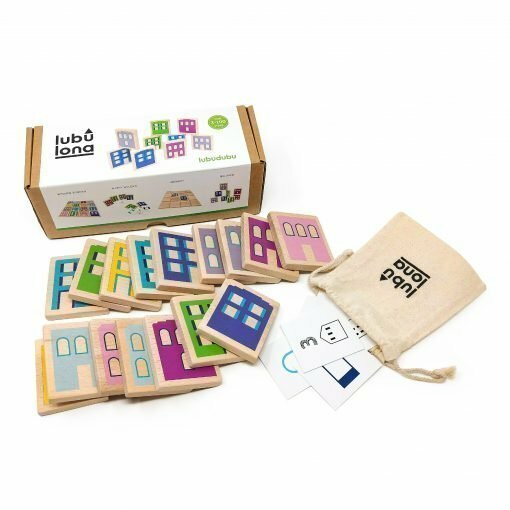 Happy Houses: Another game that can be played with Lubudubu is Happy Houses. Kids have to group houses together based on attributes they have in common, such as window number, window colour etc. There are various levels of difficulty, so that Happy Houses can be played by kids between three and 8 or 9 years. Promotes logical thinking and concentration. Window-Sudoku: There are houses with 3, 4, 5 or 6 windows. Kids can lay the houses out in a 4 x 4 square, making sure that in each row there is a house with 3, 4, 5 and 6 windows. Suitable for kids from 6 years. Helps kids improve logical thinking and mathematical skills. 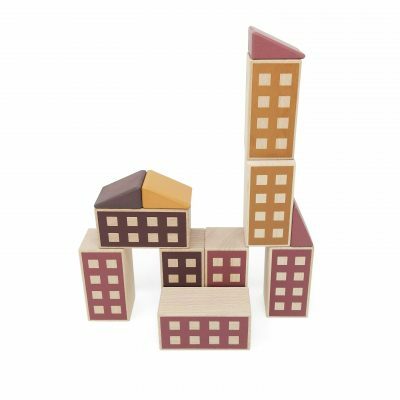 Balance game: The houses can be used to construct little towns, towers or any other construction the kids come up with. This game supports the development fine motor skills and is suitable for all kids.